The holiday season is upon us, which means my “lists” have begun! Notice the “s” at the end of list. These lists are not what I want for Christmas, but what I need to accomplish before Christmas gets here. The grocery list for cookies and special Christmas meals, the party list, the school list, and most importantly the “who we need to buy Christmas presents for” list. As I finished the “who we need to buy Christmas presents for” list and looked at how long this list was, I felt overwhelmed. I questioned when I was going to get all this done and how was I going to pay for it all. I wasn’t feeling rich at all; in fact, I was feeling defeated. There have been quite a few moments and days lately where defeat has overpowered the richness in my life. Life has a way of throwing you curveballs just when everything is going well and you think you’ve figured everything out in this life. I have contemplated sharing this latest news, as I’m honestly embarrassed to admit the reality of my life and worried about what people may think about our family. But I cannot worry or stress about what people think. This is my life. This is our life. We cannot change it or look back but only move forward. Recently our son Luke was diagnosed with Type 1 diabetes. This diagnosis came out of nowhere after what we thought was a virus or a stomach bug or maybe even the flu. When they told us he had type 1 diabetes my mind immediately started asking questions. Why? Why did our family get another blow? Why Luke and not me? What did I do to deserve this? Did I do something wrong as a child? Did I eat something wrong when I was pregnant? Did I yell too much at my kids this year? Am I being punished in this life? 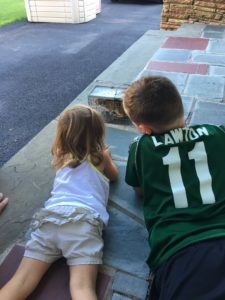 Lots of questions and A LOT of mom guilt. First Gracie dies of cancer and then Luke gets diagnosed with a disease that is life threatening if not taken care of daily for the rest of his life. Why? Why? Why? Once again I am feeling defeated. 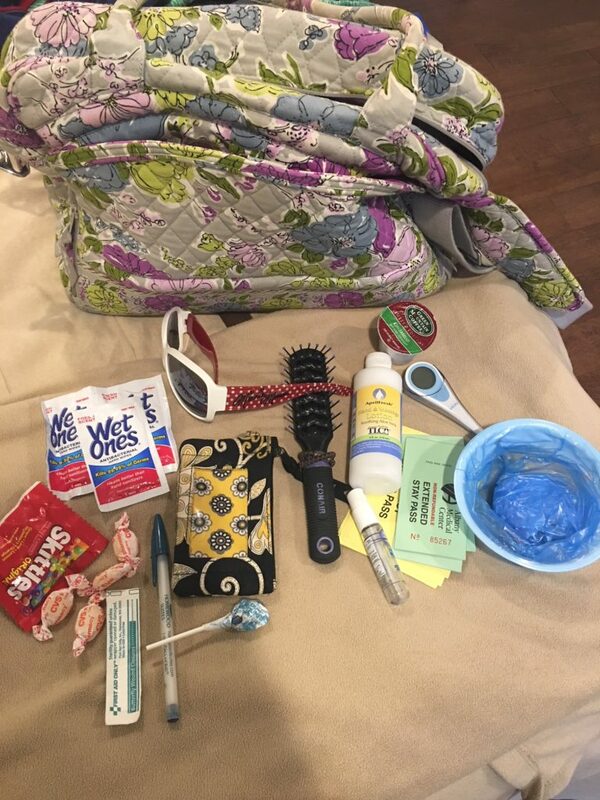 The worry of a child with type 1 diabetes is very overwhelming. Is he low? Is he high? Did I count the carbs correctly? Has it been three hours since his last insulin? Do we need more supplies? Will his diagnosis be accepted by his friends? Will he be invited to parties or sleepovers with his friends? Will the parents be supportive? How will he handle school? Will he miss classes to go to the nurse? Will his grades go down? How will he handle his sports schedule? Puberty is already scary enough; how will diabetes mess with that? Will he ever be able to have a beer (when he’s 21 of course)? OMG, what will he do when he goes to college? I might have to go with him! The questions and worry and mom guilt never stop. With lots of time and patience, I am slowly learning a lot about this diagnosis. Type 1 diabetes will never go away, but it is manageable. Luke will need insulin to stay alive for the rest of his life. Type 1 diabetes has no known cause and no cure. It is an autoimmune disease in which the body attacks the beta cells in the pancreas. I did not cause this. So please don’t think that I mis-fed my son or that he didn’t get enough exercise. That only exacerbates my mom guilt for no reason. Over the course of a month, I have learned that kids with diabetes can do everything that other kids can do; they just need to adapt activities to keep blood sugars from going too high or too low. Diabetes is just one aspect of a child with type 1. I know I need to take care of his medical needs but always try to make him feel like a kid first and foremost. Luke is doing AMAZING with all of this. He’s handled it wonderfully, is managing it successfully, gives himself his own shots and does not let diabetes define him. At this moment, he is in control of diabetes and is not letting diabetes control him. I can only hope and pray that it stays this way. He is not feeling defeated, so neither should I. It truly is all in how you look at things. I do realize that I am not alone. There are a lot of people out there who are also feeling defeated this holiday season… Holiday stress, anxiety, depression, financial struggles, loneliness, missing a loved one, illness, painful and life changing diagnoses … the list goes on and on. I hope and pray that anyone feeling these defeats can look at the situation again and find some type of richness to it. This Christmas season I hope that we can all try to spread a little Christmas cheer and kindness to those who are hurting and feel defeat. It is very hard to know who those people are as many don’t show their pain or defeat. So simply being kind to everyone and anyone you meet can change someone’s day. I hurt everyday knowing that Gracie is gone, but I feel rich for knowing her and loving her for the time she was here. I also feel very rich to have friends and family who help me find the good and fill my heart with love and thankfulness instead of defeat. But not everyone has the same support I do. A simple hello, how are you, holding the door open for someone, baking someone cookies, letting someone ahead of you in line, a Christmas card, a phone call, or a simple smile are just enough to turn one’s day around. Simple acts of kindness can make you and the person receiving them feel rich. 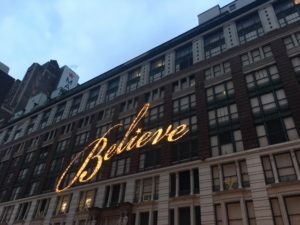 Someone gave me this quote a while ago and when things get tough I remind myself, “You don’t have to do anything, you GET to do everything.” My Christmas wish is that when you are feeling defeated, you remember this and can find your way to making yourself and someone else feel RICH with love again. Merry Christmas. “Today be thankful and think of how rich you really are.Your family and friends are priceless, your time is gold, and your health is wealth”. If you’ve golfed with us in the past, you may have realized that today we are missing a very loyal and foundation member who usually golfs and who played a very big role in all the little details that make this event successful. Last May the world lost a great man, Ken Lawton. He was a founding member of our foundation and Gracie’s papa. For those of you that don’t know, Gracie died in her Papa’s arms. I’m hoping she’s sitting in his lap, in Heaven, as we speak and they’re smiling down on all of the love that’s here today. So please raise your glasses in honor of one of our heroes…. My dad, Ken Lawton. 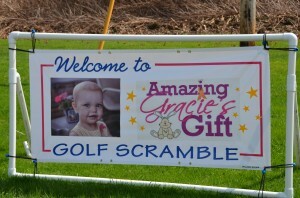 Welcome to the 7th annual Amazing Gracie’s Golf Scramble! Thank you for spending the day with us and for raising money for Amazing Gracie’s Gift Foundation. First let me start with today. I absolutely loved seeing all your smiles, hearing your laughter and watching the great interactions from golfers, volunteers and all the people involved in making today successful. I’m not sure if you realize how amazing today has been: Today we had over 160 golfers, over 30 volunteers, over 100 donations from some amazing people and businesses, and sponsorships totaling over $13,000 before the tournament even began! Because of our increase in sponsorships, donations and grants over the past 7 years we are able to expand our services and events from Albany to Syracuse. Which means we are able to directly impact and help many more families who are struggling emotionally and financially with their child’s diagnosis. To date we have helped over 500 families through our basket and backpack events, gift giving and volunteer hours at the hospitals and RMH and by individual financial assistance or memory making vacations. We are also happy to announce that we will be sponsoring 2 new programs at the Melodies Center at Albany Med, Beads of Courage and Flashes of Hope. Beads of Courage is a program in which children tell their story using colorful beads as meaningful symbols of courage that commemorate milestones they have achieved along their unique treatment path. Flashes of hope’s purpose is multi-faceted in that it not only gives families the opportunity to receive a professional photo session, but it also provides patients with the opportunity to document their treatment journey and capture in lasting images, their tremendous courage and strength. Both of these programs will allow us to touch the lives of more families and help them create memories. Today we are not here for Gracie, but instead we are here in memory of Gracie. She touched all our lives in one way or another and we are paying it forward by being amazing in memory of her. What we are here for today is the kids who are battling cancer or a life threatening illness. We are here to help them make memories and to support them, both emotionally and financially. The giving hearts of all the people in this pavilion/room and all those who couldn’t be here today continue to amaze us by helping us achieve this goal. Mother’s Day 2016 was a day my husband Steve and I will never forget, the day I delivered Mya, our fifth and final daughter. Our family was complete, Steve and I could not have been happier. Mya’s first three months went by fast but smooth. After a week of what we thought was the stomach bug, two trips to the Emergency room and one to her doctor, we were devastated to find out that Mya had cancer. We were admitted to Upstate Golisano Children’s Hospital for further testing. 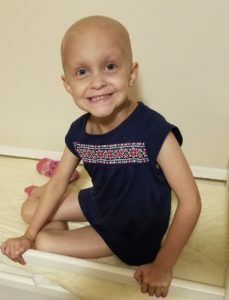 A few days later it was discovered that Mya had AML (acute myeloid leukemia), and it was a subtype with a very poor prognosis and she would need a bone marrow transplant. Mya and I spent most of the next four months in Golisano for three rounds of induction chemotherapy. While Steve had to stay home because of work and to take care of Mya’s older sisters. We were fortunate that one of her sisters was a perfect match for the transplant. December 6th, 2016 we made the trip to Philadelphia. December 16th was the big day, transplant day. The day where one of my daughters saved my other daughters life. We spent 81 days in Philadelphia, which brought our total to almost 7 months of Mya being away from her daddy and sisters. I don’t know if there was anything more exciting than the drive home from Philadelphia, our family was finally going to be together under one roof. Unfortunately, less than 24 hours after we got home, her oncologist called to tell us that the bone marrow biopsy that they had done before we left showed signs of cancer, she had already relapsed. We were told to stop all of her anti-rejection drugs, and her only chance of survival was for her sister’s cells to take over and kill the cancer. It took almost two months, but her sister’s cells did in fact win, and she was back in remission. Our family was together, Mya was flourishing, crawling and starting to walk, eating and drinking and was finally a normal baby. Until June 26th, the dreaded day we found out she relapsed, and not a mild relapse this time, her body had been completely taken back over by the leukemia. Our options were limited, her body wasn’t ready and couldn’t survive aggressive chemo, Mya was terminal. Our options were palliative chemo to keep her comfortable and buy us as much time as possible, or make her comfortable for her remaining few days left on earth. Two days later we were readmitted to Upstate Golisano to have a port placed and to start palliative chemo. We were all devastated, Steve and I decided to make a bucket list with our girls, something they all wanted to do with Mya. We had no idea how we were going to afford it, as it had been almost a year since I was able to work, and though Steve was able to keep us afloat for the last year, we didn’t have anything left over for vacation. Mya was too young for Make-a-Wish. That is where Amazing Gracie’s Gift saved the day. They reached out to us and said that they wanted to make our dreams come true. That every family deserved the best memories. They told us to plan our dream vacation and they would make it happen. They did not disappoint. Our family was able to go to Sesame Place, the Philadelphia zoo, the Adventure Aquarium and Crayola Experience. Our girls had a long weekend of stress free, cancer free, hospital free fun with Mya. We got to see Mya on a tube in the lazy river, we ate dinner and had a meet and greet with all the Sesame characters, we got to hear her bark at every animal at the zoo and aquarium, we got to have our own coloring book pages made with Mya’s picture. We had a perfect vacation. Because of Amazing Gracie’s Gift, Steve and I were able to spoil our girls, thank them for helping us survive the last year, and we got to make memories that will last a lifetime. Thank you again to everyone involved with Amazing Gracie’s Gift, I hope you all know what you mean to families like us! Unfortunately, Mya did not make it. She passed away December 19, 2017 at 19 months old. Because of all of you Amazing Gracie’s Gift has been able to help support Mya’s family! 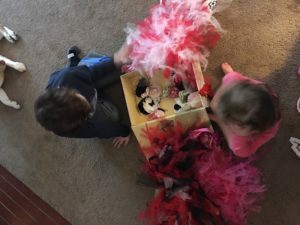 We will do whatever it takes to help families like the Corigliano’s make memories to put smiles on their faces and memories filled with love in their hearts. Be Amazing like the RMH of Albany. A place that provides comfort, hope, love, and support for so many families. The RMH now has more room for love in their new house and can hold up to 25 families. One of those rooms was built in Gracie’s name. It is beautiful, warm, comforting and totally amazing. Be Amazing like the Melodies Center at Albany Med and like Golisano Children’s Hospital whose efforts to help save and cure children are endlesss. 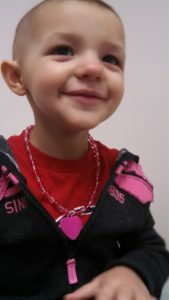 Be Amazing like Lilliana who is 3 years old and is in remission after bravely fighting leukemia. Be Amazing like Jacinto who is 1 year old and has been fighting a rare brain cancer. Be Amazing like 2 year old Giada who has bravely been fighting cancer. Be Amazing like Will who has been bravely fought cancer and has had to have a lung transplant due to the side effects of treatment. Be Amazing like 18 year old Marcus who is fighting a type of lymphoma. Be Amazing like 4 year old Cooper who passed away last week from leukemia. Be Amazing like Ava who at 3 years old passed away from neuroblastoma this past September. Be Amazing today and always for all the kids who are suffering and for all the kids who have lost the fight. And lastly, my motto and what keeps me going on a daily basis – Be Amazing like Gracie. Thank you for the past seven years. Let’s keep it going and make it to 10 years! All is calm and all is bright on this early morning as I sit in my living room with nothing but the Christmas lights and fireplace on. As I write this morning I’m thinking back to my ride home from work this past week. Christmas music was playing and instead of turning the channel I listened and was brought back to our Christmas 7 years ago. Seven years ago was our last Christmas with Gracie. A smile and a feeling of peace and gratitude came over me as the song “Christmas is the time to say I love you” came over the radio. I began thinking about all of the amazing and generous acts of kindness I witnessed during that Christmas. They all brought a big smile to my face and a sense of calmness to my racing, anxiety filled brain and body. A feeling of wonder filled my mind as I thought about who did what and how everyone pulled together to make Christmas 2011 one of the best Christmases we’ve ever had. It wasn’t the best Christmas we ever had because of the number of presents under the tree. It was the best Christmas we ever had because we witnessed the true meaning of Christmas. It was a time filled with love and generosity that went above and beyond to make us not feel so alone, sad or afraid. That December I was contacted by a group of friends while we were in the hospital with Gracie. They wanted to decorate our house for us so that when we came home from the hospital it was done and we could enjoy it. This group of people managed to get and set up a beautiful tree for us. They didn’t stop there. They took down the 20 plus bins of Christmas decorations from the rafters and decorated our house. They sifted through the many candles and coffee mugs I’ve received over the years from my students and had a good laugh at the fact that I have kept every single one of them! Soon after I received an intervention on “cleaning out“ the many, many, many mugs and candles! These laughs were a welcome distraction at that time! When we got home from the hospital we were treated to a private caroling session on our front lawn from a group of 5th and 6th grade girls and teachers from my school. It was beautiful and brought smiles, tears and tons of love as I looked around at all the people who cared so very much about Gracie and my family. That Christmas we were surprised by many food and gift card drop offs outside our door, as well as gift baskets filled with comfort items for our family. Blankets, board games, snacks, Christmas movies, holiday trinkets to help us get in the spirit of Christmas in our own home. These are just some of the things that happened that Christmas. 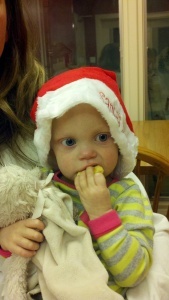 You see we couldn’t take Gracie out because of her frail condition at that time, but you all brought Christmas to us. You brought the true meaning of Christmas to us. You brought the gift of love, laughter, peace and smiles to our hearts and minds as we were losing our baby girl. As I look back at that Christmas the words to that Christmas song come to my mind again… Christmas is the Time to Say I Love You. I believe that’s what you all did. Seven years later I get it. We all wanted a miracle for Gracie to get better but we could not physically do that. Instead you surrounded us with gifts of love, as Christmas is the time to say I love you. So this Christmas I want you all to know we love you too. As quick as that smile and feeling of peace comes to me during the holiday season I’ve learned that it can quickly turn into tears and sadness. I miss Gracie. I wonder what Christmas would be like with all three of my kids here. I also feel saddened that there are other families that are facing the same journey as we are. It has been a tough year at Amazing Gracie’s Gift. Some of our families will be spending this Christmas in the hospital. 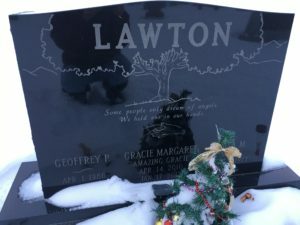 Some are facing their last Christmas with their child. And some are facing their first Christmas without their child here. We have lost Amazing Gracie’s Gift supporters that have been with us since Gracie’s diagnosis and their families are facing their first Christmas without them here. We also have some supporters that are very sick and may be celebrating their last holiday with their family. My heart aches for all these families. But at the same time a smiles crosses my face and my heart skips a beat as I see and hear our community help all these families as much as they can, like they did for us. I see and hear the true meaning of Christmas all around me. I see and hear the gift of love, laughter, prayers, support and kindness for all. My Christmas wish this year is that we can continue to put smiles on faces, a feeling of peace in minds, and our hearts will continue to give to those who really need it right now. Spend time with your loved ones this Christmas because you don’t know what the next year holds, what next month holds, not even what the next day or minute has in store for us all. And please remember that Christmas is the time to say I love you. This beautiful little girl and her family are a good reminder for all that childhood cancer awareness is not just for September. Children are diagnosed with cancer everyday. These children are fighting for their lives everyday. Some of these children made it to remission and some did not. This is why we raise awareness everyday and more importantly take action each and everyday. After receiving Ava and her family’s story this morning I stepped back out of this crazy life of gossip, stress, and worries and reminded myself once again to enjoy and make memories with those we love. Much love to Ava and her family today and always. “It was a Tuesday. It was the perfect blend of almost summer and sunshine. My girls were 22 months old and 6 months old. Ava, our oldest, wasn’t feeling herself after the 10 days they asked us to give her following her first appointment. She was flushed, weak, and still having trouble walking. The “virus” that they said she probably picked up earlier that month turned out to be a little more serious than they anticipated . We were told going to the ER would help to get the results of scans quicker since it was now almost 430pm. Over the next several hours, a tumor was located in the base of her skull. My girl had no idea what was going on, but we were together so she knew it would be okay. We were admitted to D7 at 11:50pm, after 6 hours in the holding tank known as the pediatric emergency room. We had the clothes on our backs, a juice cup, one extra diaper, a cell phone with a low battery life, and my wallet. We were together and alone, Ava and I. The next 17 months of our life would center around treatment to cure Neuroblastoma stage IV, a rare and aggressive form of childhood cancer. Only 700 cases per year are diagnosed and only a fraction of those are stage IV. We centered Ava’s life around keeping her a child. We did everything possible to keep her happy, motivated, smiling, engaged, and thriving. We used speech, music, and occupational therapy professionally but the real therapy required no assistance from outside sources. We played; finger paints, puzzle stations, markers, sticker art on skin, glow sticks before bed, placing trinkets in varied sized cups, dance parties, water table fun, bubble foam at bath time, bubbles, tea parties. As a mother of a child with pediatric cancer, my full time job became play. I would do whatever necessary to provide my daughter real life in a world which did not allow for her to be exposed to other children, public facilities, or even the outside at times. Fear of sunburn from radiation, fear of infection when immunocompromised, and fear of bruising or bleeding from low counts pushed PLAY into over drive. Ava was always inspired, active, and full of spontaneous play. What she lacked was fun time with her sister, because treatment often did not allow for togetherness. One summer day at clinic, the Child Life team shared that Ava would be a recipient of Amazing Gracie’s Gift. I didn’t know what that meant, but tears instantly started pouring from my eyes like a faucet. As the foundation was explained, I instantly knew what our gift could be if it was possible. 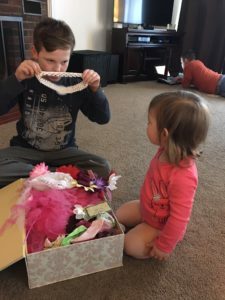 We wanted to get the girls something for them to play with together, but fear of a financial commitment when we had so many other “unknowns” in treatment was scary. Our wish for our daughters was a playhouse. A few weeks later, we had a very large package on our porch with a few other items for our girls. Later that night, the playhouse was set up. Normally, these types of houses are for outside. But for our girls, we wanted to encourage year round togetherness through all the stages of upcoming treatment. Addalyn, who was only 6 months at Ava’s diagnosis, was now walking (and running for that matter). So here it sits, in my kitchen, large and in charge. It is full of play food, chairs, books, stuffed animals, and beautiful memories. Ava passed away on September 16, 2017. About 6 weeks ago, my daughters were playing in this playhouse together. This gift from the foundation is more than just a toy. It was the gift of memories. 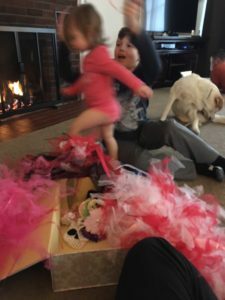 A gift of seeing the joy in Ava’s eyes as she play with her sister. It is a gift of a very warm sensation in my heart, knowing that my daughter lived a life full of fun during her 3 short years. This gift to our children carries beautiful reminders to us as little sister eats her snack in the house and fills her basket with play food. When she opens the windows and looks out, I remember her opening them and looking out at her sister giggling. When I hear the door bell on the house, I remember Ava standing inside and opening the door for her sister to come in. My girls. Always so gentle and full of love.